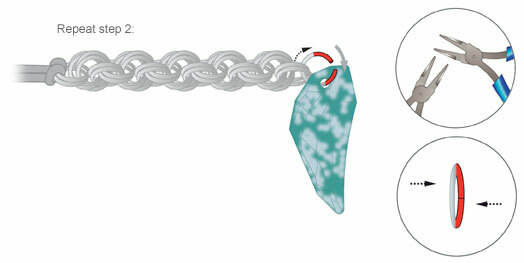 Take 2 closed 12mm jumprings and attach the satin ribbon onto them as you see in the illustration. Open two 12mm jumprings and attach them to the first two jumprings. Take another 12mm jumpring and hang it onto the 4 others as you see in illustration. Repeat this step with one more 12mm jumpring (see illustration). Repeat Step 2 nine times and hang another 12mm jumpring with the Swarovski pendant article 6015/A mosaic Pacific opal onto last 2 jumprings. Take a headpin and slide on one Swarovski bead article 5000 and form a loop with round-nose pliers and cut off excess with side-cutter. 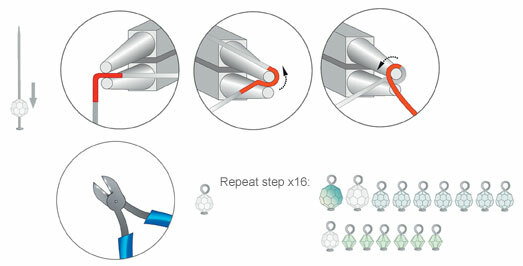 Repeat this step 16 times with the other Swarovski beads article 5000. Open 17 6mm jumprings with flat-nose pliers and hang the Swarovski beads with onto the 12mm jumprings of the Swarovski pendant. See the illustration for correct positioning. Remove satin ribbon and hold the two jumprings with tweezers. 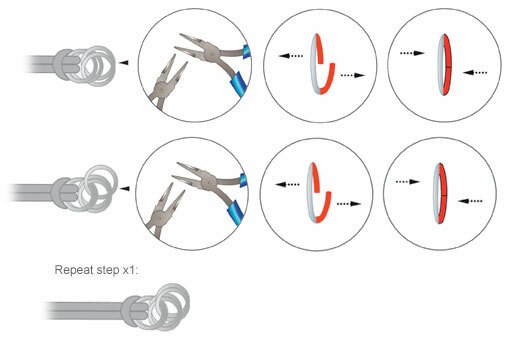 Insert satin ribbon into the 4 jumprings as you see in illustration and repeat Step 1 to fix the satin ribbon. 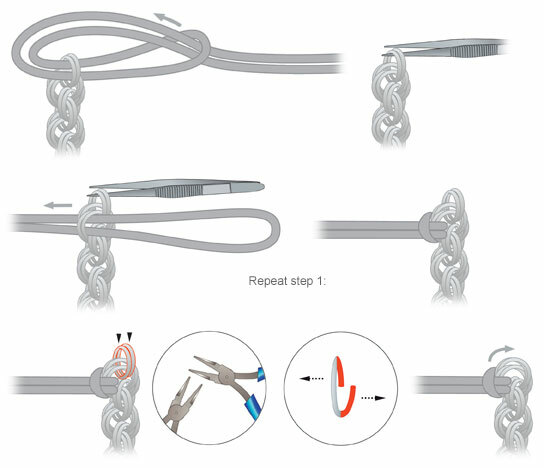 Remove the upper two jumprings with pliers.